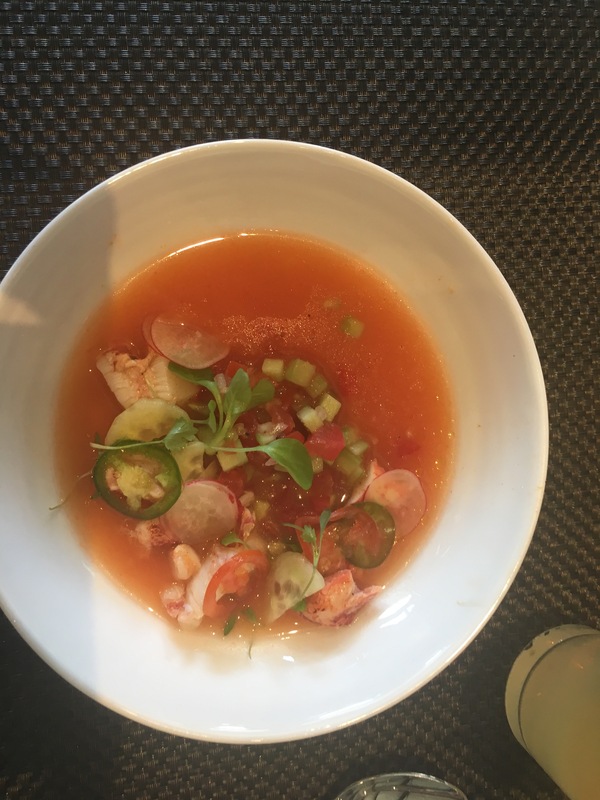 With the opening of the onsite Nobu last year, the BNP Paribas Open at Indian Wells entered a completely new echelon of stadium food. While other sports venues might brag about a Shake Shack or a sushi bar, the BNP Paribas Open opened a branch of one of the world’s most celebrated sushi restaurants where you could watch the matches while dining on first rate cuisine. This year, the organizers have upped the ante, opening a branch of Wolfgang Puck’s iconic Spago restaurant. While hearing the word Spago immediately reminds those old enough of the heady days of Bruce and Demi and Burt and Loni, Spago was a pioneer of California cuisine as much as it was a star hangout. The temporary outpost of Spago located in Stadium 1 of the Indian Wells Tennis Garden was built in 90 days, and took over space previously occupied by two private suites. Despite the quick construction, the restaurant, and its cuisine, feel like they’re an established part of the Indian Wells tennis experience. In the name of newsgathering, I sacrificed myself to the will of the people and tried out a few things this afternoon. First, if you want to dine at Spago, note that it is no reservations, and gets progressively more packed with longer waits as the day goes on. Like, if you’re planning on eating there tonight during Roger Federer’s night match, you should probably already be in line. But, if you go when it opens at 11am, you pretty much have your pick of where you would like to sit. And, where you pick will matter — seats directly overlooking the court come with a $75 per person food and drink minimum at lunch, which rises to $100 per person at dinner. That said, two people having the lower priced dishes on the menu for lunch, ordering an appetizer, entree, a soft drink and sharing dessert can have a very satisfying meal for $50 per person. There are certainly cheaper options onsite, but this compares pretty favorably with a similar experience offsite. 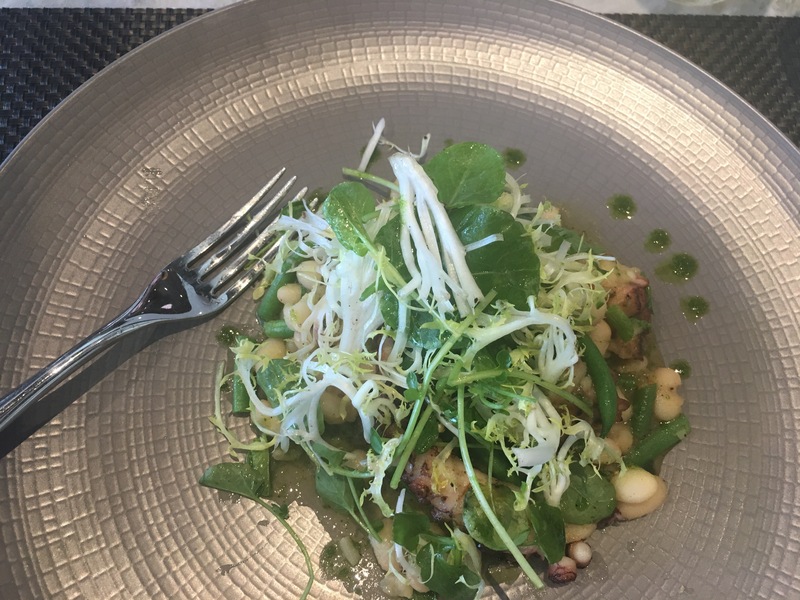 There are many light, healthy options on the menu, including a refined and deconstructed gazpacho with lobster, and a grilled octopus with white beans and salad (below). Together both made a delicious meal on a hot day. If you want something more substantial, there are also sandwich, burger and steak options. And, Wolfgang Puck afficionados won’t be disappointed. 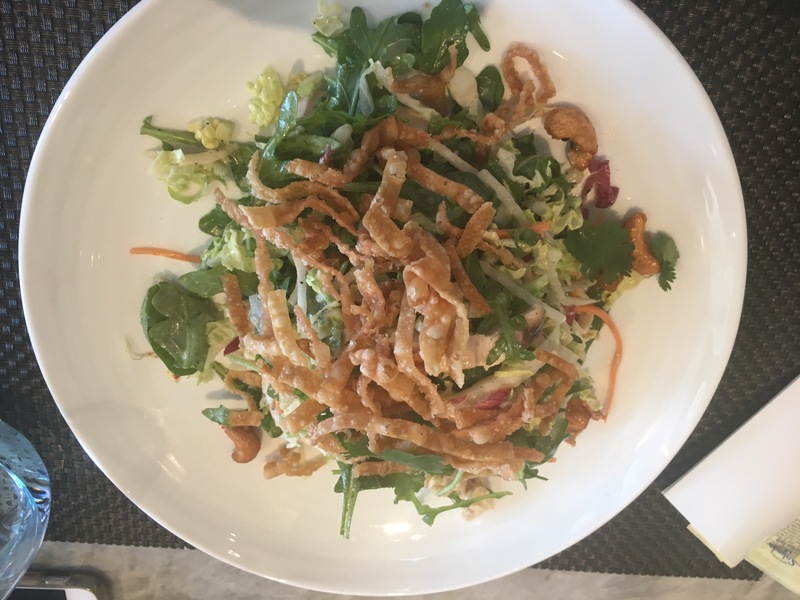 The menu features many of his classics — the Chinese chicken salad popularized at the now defunct Wolfgang Puck Express outlets that once peppered southern California, the smoked salmon pizza, and an impressive looking Wiener Schnitzel. There are entrees at price points from approximately $20 to $48, ranging from a simple angel hair pasta with marinara sauce to a delicate steamed sea bass. But, be sure to save room for dessert. 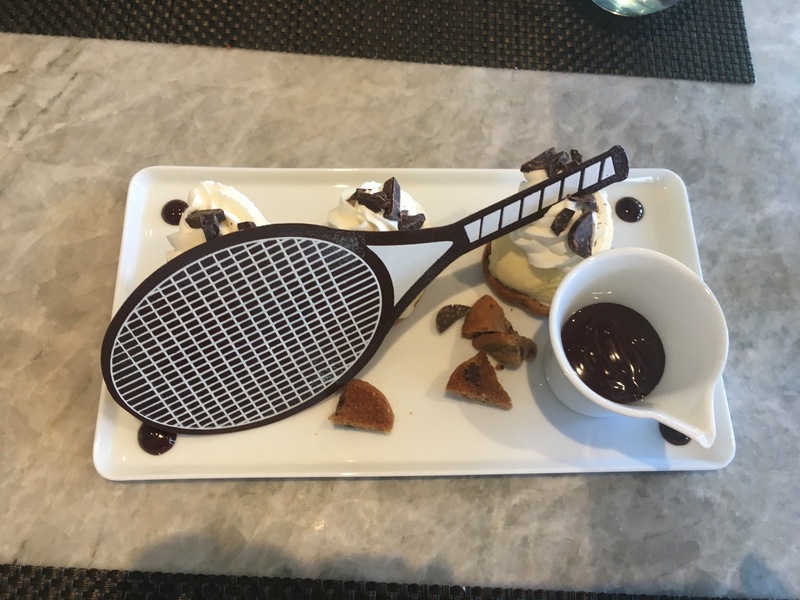 The menu again hits all of the classics — from a creme brulee to a molten chocolate cake, but for the whimsy alone, I’ll recommend the tennis themed desserts — every bit of this chocolate racquet is edible, and not a crumb was left when I was done. Chances are, if you’re spending multiple days at the BNP Paribas Open, you’re not going to be able to get out to have a nice meal while here. Many restaurants in the immediate area close before the night session lets out, much less when one actually gets out of the venue. If you happen to have the time, and the inclination, it’s certainly a pleasant way to spend part of your day on the grounds.